We recommend you login immediately to improve your online experience. Logging in to your online account allows you to view your contracted pricing, order history, manage favorites, and more. We’d love to hear your comments and suggestions for improving our website! Please take our Website Experience Survey to let us know what you think. Prices shown when not logged in are list prices. Please login to gain access to your contracted pricing available in our system. You must then select an account to display contracted pricing for that specific account. If you do not have a login, you may create one by selecting Register from login menu OR by contacting Customer Service at 800.435.4242 to set up an online account on your behalf. If your login is enabled to order for multiple accounts, please select one of the accounts after logging in. Select “Switch to Customer #” at top of page and use the drop down menu to select one of your enabled accounts. Contact Customer Service to adjust your list of enabled accounts. For orders outside the USA and Puerto Rico, please contact our International Department at 818.897.1111 or email intl@pdcorp.com. Payment terms are net 30 days for offline orders. Credit application may be required for terms. State and local taxes, if applicable, will be included when invoiced. Precision Dynamics Corporation (PDC) accepts American Express, Mastercard, Visa, and check at the time of order. We accept and encourage electronic payments (ACH/wire). All prices are in U.S. dollars. Foreign import duties and exchange rates, if any, are the responsibility of the customer. Unless otherwise stated in writing, price and delivery terms are F.O.B. origin (site of shipment), as defined in Incoterms 2000, and such prices do not include sales, use or other taxes or any export package cost, transportation, freight handling charges, export/import license fee, customs duties and the like, all of which shall be paid by Purchaser. Unless otherwise agreed to in writing, delivery dates are estimates only, and PDC shall not be liable for any damages, consequential or otherwise, resulting from the failure to deliver the goods by a particular date. Precision Dynamics Corporation (PDC) has the capability to produce custom wristbands and labels to your specifications. Please call your local Precision Dynamics Corporation (PDC) sales representative or Customer Care for additional information and assistance at 800-435-4242. Please allow at least 15 working days for new custom orders and 10 working days for repeats after approval of proof. To ensure accuracy, it is recommended that all orders for custom imprinted products be submitted in writing, accompanied by a copy or actual sample of imprint. Minimum quantities may be required. Due to manufacturing fluctuations on custom products, we reserve the right to ship +/- 10% of the quantity ordered. Invoices will be adjusted to reflect the actual quantity shipped unless purchase order states no over or under shipments. In the event Purchaser desires to cancel an order, PDC may accept such cancellation in its sole discretion upon cancellation of a custom order, once a purchase order has been issued, the customer will be responsible for all production charges accrued through the date of notification of cancellation and any product already produced prior to the receipt of cancellation. Precision Dynamics Corporation (PDC) assumes no responsibility for custom label orders on which the customer has made an error in quantity or label specifications. Customer assumes sole responsibility for accuracy and use of artwork and agrees to defend and indemnify Precision Dynamics Corporation (PDC) from any and all claims for copyright, patent or trademark infringement relating to customer supplied materials, art work and/or design. By signing/approving any artwork, customer certifies that it is legally authorized to use such designs, logos, trade names, and/or trademarks. OTHER THAN FOR WARRANTY CLAIMS, CUSTOM PRODUCTS SHALL NOT BE ACCEPTED FOR RETURN. Tooling, Negatives, Plates, Artwork And Overruns. If Purchaser pays for tooling, negatives or plates (collectively "tooling") then such tooling will be the property of Purchaser and will be maintained free of charge by PDC while being used in production and for twenty four (24) months following the last date of use, after which the tooling will be destroyed, unless otherwise agreed in writing. If Purchaser does not pay for tooling, then any such tooling will be the property of PDC. All artwork submitted by Purchaser is subject to the approval of PDC. PDC will notify Purchaser of any additional charges for retouching or reworking and will bill Purchaser at cost for same. On custom product orders PDC reserves the right to ship not in excess of ten percent over or under the quantity ordered unless purchase order states no over or under shipments. When the customer orders in error and the product is not older than 60 days from the date of invoice. Return freight is the responsibility of the customer. A 15% restocking fee will be assessed for all products. Customer will receive credit for original order, excluding any freight charges. When a PDC error or product defect occurs, if reported to PDC within 60 days from the date of invoice, full credit, including freight, will be issued. All returns for credit require a written Return Merchandise Authorization (RMA) number from PDC. No returns will be accepted without a RMA number. The RMA number must have supporting paperwork indicating original purchase order number, PDC sales order number, date of original order, etc. If a return is submitted without an RMA number, product will be refused and sent back to the customer at customer’s expense. Call tags will be issued for customers with the exception of large shipments or pallets. The decision to issue call tags will be based on the reason for the return for large shipments or pallets. Merchandise must be returned in full boxes, original packaging and in saleable condition as determined by PDC at its sole discretion. Authorized returns must be received by PDC within 30 working days from the date of RMA issuance. If there is any loss or damage at the time of delivery, it is essential to note it on the delivery receipt. Any concealed damage should be reported to the delivering carrier within 15 days. Keeping the entire package is necessary until after the carrier issues a concealed damage inspection report. Products sold are of merchantable quality at the time they are delivered, and are manufactured in conformance with PDC’s specifications, drawings, or other descriptions; and that PDC conveys good and marketable title to them upon completion of sale. PDC warrants against defects in material, workmanship, design, and manufacturing. PDC further represents and warrants that the products will conform to the specifications, drawing, and samples furnished by PDC and will be safe for their intended use. If any products are defective and a claim is made, Precision Dynamics Corporation (PDC) will replace the defective products. Precision Dynamics Corporation (PDC) will bear all costs of returning and replacing the defective products. To the maximum extent permitted by applicable law, Precision Dynamics Corporation (PDC) disclaims all other warranties, expressed or implied, including but not limited to implied warranties of title, non-infringement, merchantability, and fitness for a particular purpose with respect to the products. Precision Dynamics Corporation (PDC) makes no other warranties other than those expressly provided for herein. In no event and under no circumstances whatsoever shall PDC and Purchaser be liable to each other for any indirect, special, or consequential damages, whether foreseeable or unforeseeable and whether based upon lost goodwill, lost resale profits, loss of use of money, work stoppage, impairment of other assets, or otherwise and whether arising out of breach of warranty, breach of contract, strict liability in tort, negligence, misrepresentation, or otherwise, except only in the case of personal injury where applicable law requires such liability. The invalidity or unenforceability (in whole or in part) of any provision, term or condition hereof, will not affect in any way the validity and enforceability of the remainder of such provision, term or condition, or any other provision, term or condition. These Terms and Conditions may not be modified, terminated or repudiated, in whole or in part, except in a writing executed by the authorized representatives of PDC and Purchaser. PDC may, at its sole option, treat any attempted modification, termination, or repudiation to which it does not assent in writing, as a breach of these Terms and Conditions. Upon any breach by Purchaser, or failure by Purchaser to comply with any of these Terms and Conditions, or if Purchaser becomes unable to conduct its normal business operations (including inability to meet its obligations as they mature), or if Purchaser becomes the subject of any proceeding under any state or federal bankruptcy law or other law, or makes any assignment for the benefit of creditors, PDC will have the right to immediately cancel or terminate any and all agreements with or obligations to Purchaser relating to sales of the goods, in whole or in such part, which may result in the nonshipment or cancellation of Purchaser's pending or future order(s) and/or termination of Purchaser's relationship with PDC, and to recover from Purchaser damages for breach (excluding consequential damages) and any unpaid installments due shall become immediately due and payable. All remedies in these Terms and Conditions will be cumulative, and not alternative or exclusive, and will be in addition to all other rights and remedies provided by applicable law. The exercise or failure to exercise any remedy by PDC will not preclude the exercise of the same or other remedies under these Terms and Conditions. PDC will not be deemed to have waived any provision of these Terms and Conditions or any breach by Purchaser of any provision hereof, unless specifically set forth in writing and executed by an authorized representative of PDC. No such waiver by PDC will constitute a waiver of such provision or breach on any other occasion. PDC shall not be responsible for any failure to fulfill its obligations hereunder due to causes beyond its reasonable control, including without limitation, acts or omissions of government or military authority, terrorist actions, acts of God, shortages of materials, transportation delays, fires, floods, labor disturbances, riots or wars. These Terms and Conditions, and the transactions contemplated hereby, will be governed by, construed and interpreted in accordance with the substantive laws of the Wisconsin (excluding the Convention on Contracts for the International Sale of Goods) without regard to its conflict of laws rules. Any legal action with respect to any such transaction must be commenced within one year and one day after the cause of action has accrued. These Terms and Conditions, together with any quotation, order acceptance, or invoice subject to these Terms and Conditions, constitute the entire agreement and understanding of PDC and Purchaser. PDC assumes no liability except as expressly provided in these Terms and Conditions. PDC is a Brady Corporation Business. Brady Corporation has a global Code of Ethics Policy (the “Policy”), which governs the behavior and relationships between Brady’s employees and its customers, suppliers and distributors. The Policy can be viewed at www.bradyethics.com, under the Code of Conduct tab. If you believe that a PDC or Brady employee's conduct violates the terms of this Policy, please report the violation by using the confidential website (www.bradyethics.com). These Terms and Conditions may be modified by pre-established written contracts between Precision Dynamics Corporation (PDC), Customers and or Group Purchasing Organizations. If the product is only available in one color, the product will be directly added to your cart. Click view cart to change the quantity or remove the product from your cart. If the product is available in other colors, you will be prompted to select the specific colors and quantities you want and then click the Add to Cart button. You can view your cart at any time by clicking on “View Cart”. If you want to continue shopping, click the “Continue Shopping” button. If you are ready to checkout, click the “View Cart & Checkout” button. If you know the product number or name, you can enter it in the “Quick Order” box located on the top of the website.An overlay window will appear. Enter the product numbers or names, specify quantities and then click the "Add All to Cart" button. When you are done adding products to your cart, you can close the window to continue shopping; click View Cart; or click Checkout. For products you order regularly, we recommend that you add them to your Favorites list. You must be logged in to add products to your Favorites list. Learn how to manage Favorites at the bottom of this page. Checkout: From the View Cart page, click the “Checkout” button. Follow the steps through Checkout and click the Place Order Now button on the final page. Pre-requisite: You are already logged in to your account. Click the Log Out link at the top of the web page. Pre-requisite: You must already have an established online account. Click the Log In link at the top of the web page. Enter your email address and password and click the Login button. Option 1: Go to the Log In menu and click on the “Register” link. Complete the online form and choose a password to Create an Account. You must use a valid email address for your login. In the Edit Account Information select Change Password type in your current password and your new password. Retype your password again. Hover over the Log In link at the top of the page and then click on “Forgot Your Password?” Type in the e-mail address associated with your account and your password will be e-mailed to you. If you don’t receive your password within a few minutes, be sure to check your spam folder. Customize your ordering experience for quick, convenient online ordering! Pre-requisite: You must already have an established online account and placed an order. Pre-requisite: You must already have an established online account and placed an online order that has shipped. From the My Account 360°pull down menu, click on “Order History” link. Select the order you want to track by clicking on “View Order”. In View Order you have the tracking information for the order. Click on the Waybill # which is the tracking number (blue). Pre-requisite: You must already have an established online account and placed an order that has shipped and invoiced. Pending – Order submitted by customer to PDC. Booked – Order inventory reserved and scheduled, credit card charged by PDC. Closed – Order shipped to customer. Cancelled – Order cancelled before booking. Add a new shipping address by clicking “Add New Address” and filling in the field completely. You have the option of making the new address as Default Shipping Address by selecting “Use as my default shipping address” then click “Save Address” to save. You also have the option to add a shipping address during the checkout process. Make sure you have selected the correct Billing and Shipping Addresses and click Place order now to complete your order. Pre-requisite: You are already logged in to your account. Billing address must match credit card information. You have the option to add a shipping address during the checkout process. From the Billing Address Information screen, click on pull down menu “Select a billing address from your address book or enter a new address” and select New Address. Make sure you have selected the correct Billing and Shipping Addresses and click Proceed with Checkout to complete your order. 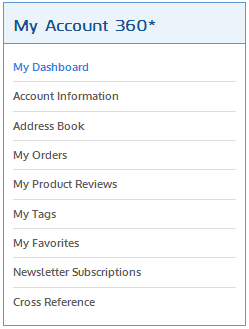 From any product ordering page, click the “My Favorites” button to add a product to your Favorites list. You will briefly see the message “Product” has been added to your Favorites.” which confirms the product was added to your Favorites list. Then you will see a list of the products you’ve added to your My Favorites list. Select “My Favorites” you will see a list of the products you’ve added to your “My Favorites” list. You may then enter the quantity and click on the “Add to Cart" button or “Add all to Cart”. You will then be taken to the "View Cart" page where you can checkout or continue shopping. Here you can view any item cross-references that have been set up for your account. An item cross-reference is a customized link from PDC Healthcare’s item number to your specific item number. To set up a new item cross-reference, contact Customer Service at 800.435.4242.